This is his story of following his dreams. This is her story of believing in love. This is his story of giving life another chance. 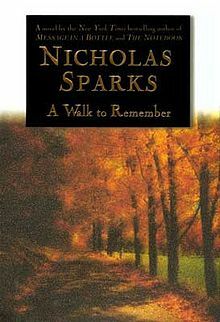 A Walk to Remember is a romance novel written by Nicholas Sparks . The storyline is in first person played by male protagonist Landon Carter , a rich boy and female protagonist Jamie Sullivan, a believer of god and daughter of the church minister. The novel, set in the late 1950’s in Beaufort, North Carolina. It is about two teenagers who falls in love despite of their different personalities.The plot starts when Landon is a 17-year-old high school senior. Landon lives in the small, religious town of Beaufort, North Carolina. His father is a genial, charismatic congressman. His father is not around very much, as he lives in Washington, D.C. Landon is more reclusive, which causes some tension in their relationship. As student body president, Landon is required to attend the school dance with a date. He asks many girls, but none are available. That night, he looks through his yearbook, trying to find an acceptable date. Since nobody else seems to be available, Landon reluctantly asks Jamie Sullivan, the daughter of the Beaufort church minister, who accepts his invitation. While Jamie is very religious and carries a Bible with her wherever she goes, Landon (one of the popular students) is reluctant to go to the dance with someone like her. When Landon is threatened by Lew, Jamie comes to Landon’s aid, to his appreciation. At the end of the night, he admits she was the best date possible. A few days later, Jamie asks Landon to participate in the school’s drama of The Christmas Angel. While Landon is not very enthusiastic about participating, he agrees to it anyway. Jamie, on the other hand, could not be happier about her new cast mate. Landon knows that if his friends learn about his role in the play, he will be teased relentlessly. One day at rehearsal, Jamie asks if Landon will walk her home, after which it becomes routine. A couple of days later, Eric mocks the couple during their walk home and Landon becomes truly embarrassed to be with Jamie. Meanwhile, Landon continues to learn about all the people and organizations Jamie spends her time helping, including an orphanage.Jamie tells Landon that all she wants in the future is to get married in a church where her mother was raised and got married and to have her father walk her down the aisle. While Landon thinks this is a strange wish, he accepts it. In truth, he is beginning to enjoy his time with her. One day, while they are walking home, Landon yells at Jamie and he tells her that he is not friends with her. The next day at the first show of The Christmas Angel, Jamie enters the stage dressed as the angel, making Landon simply utter his line, “You’re beautiful,” meaning it for the first time. Jamie’s Christmas gift to Landon is her deceased mother’s Bible. As they get in the car to go home, Landon realizes his true feelings for her. “All I could do is wonder how I’d ever fallen in love with a girl like Jamie Sullivan.” He invites her to his house for Christmas dinner. The next day Landon visits Jamie at her house, where they share their first kiss on her porch. Afterward, Landon asks Hegbert if they can go to Flavin’s, a local restaurant, on New Year’s Eve. While Hegbert initially refuses, after Landon declares his love for Jamie, Hegbert allows it. On New Year’s Jamie and Landon go to dinner, where they share their first dance. A couple of weeks later, Landon tells Jamie that he is in love with her. To his surprise, Jamie replies by insisting that he cannot be. In response, Landon demands an explanation, and Jamie reveals that she is dying of leukemia. Landon and Jamie are married in a church full of people. Although she was weak and was in a wheelchair, she insisted on walking down the aisle so that her father could give her away which was part of her dream.Landon remembers thinking “It was…the most difficult walk anyone ever had to make. In every way, a walk to remember.” When they reach the front of the church, Hegbert says, “I can no more give Jamie away than I can give away my heart. But what I can do is let another share in the joy that she has always given me.” Hegbert has had to experience so much pain in his life, first losing his wife, now knowing his only child will soon be gone, too. The book ends with Landon 40 years later at age 57. He still loves Jamie and wears her ring. He finishes the story by saying, “I now believe, by the way, that miracles can happen” and the miracle was that love can make the toughest man go soft and lead a beautiful life. This is a very mesmerising story which will touch the bottom of your heart. The poer of love is truly justified and if one steps in the shoes of the characters, i would say they can realise the charisma of love, faith, spirit of life. The storyline us smooth and will put a trance on the readers. This novel is also featured as a motion picture with some of the detailings being changed.